EWG > Agmag > Pizza and French Fry Lobbyists Also Speak For Lunch Ladies? Pizza and French Fry Lobbyists Also Speak For Lunch Ladies? School lunch ladies and frozen pizza and french fry companies have more in common than the food they serve: they have also been represented by the same lobbyists. Based on data from the Center for Responsive Politics and lobbying disclosure forms, EWG found that lobbyists at two firms -- Olsson Frank Weeda Terman Matz and Barnes and Thornburg -- that have represented the School Nutrition Association have also promoted the views of processed-food-makers like Schwan Food and General Mills as well as the American Farm Bureau Federation. The School Nutrition Association, the professional group representing more than 55,000 cafeteria and school nutrition employees, supported strong school nutrition standards when Congress enacted the Healthy, Hunger-Free Kids Act in 2010. The new law directed the U.S. Department of Agriculture to improve nutrition standards to help combat obesity, and the USDA reported earlier this year that over 90 percent of schools are in compliance with the new nutrition guidelines. But, when the House Agriculture Appropriations Bill was up for debate earlier this May, the association, sometimes nicknamed “the lunch ladies," endorsed a proposal that provided schools who had not met the standards with a waiver that allows them to opt out. Tax records show that $6.7 million of $10.5 million the School Nutrition Association collected in 2012 came from sponsorship fees from processed food companies like Schwan Food, whose subsidiaries include frozen pizza companies like Tony’s and Freschetta, and Con Agra, maker of such empty-calorie icons as Reddi Wip. These food companies pay as much as $30,000 to have their logos displayed prominently at the association’s annual conference. Schwan is one of the largest donors to the School Nutrition Association’s foundation, giving more than $50,000 to their 2013-2014 annual fund, and more than $25,000 the year before. Lobbying disclosures show that between 2010 and the first quarter of 2014, the School Nutrition Association spent $1.4 million lobbying the Congress. It paid Olsson Frank and Weeda and Barnes and Thornburg $690,000 over the four years to lobby on its behalf. During the same period, Olsson Frank and Weeda and Barnes and Thornburg were paid $2.5 million by processed food companies and other clients to lobby legislators on matters related to “nutrition” or similar subjects. Other food companies and associations represented by Olsson Frank and Weeda include General Mills, Kraft Foods, the North American Meat Association, the National Confectioners Association and the National Frozen Pizza Institute. The National Frozen Pizza Institute is managed by the American Frozen Food Institute, whose members include Con Agra Food, McCain Foods and Schwan Food. Barnes and Thornburg also represents the American Farm Bureau Federation, on-line gaming, and the National Rifle Association. The School Nutrition Association’s political action committee is a small player in political campaigns. 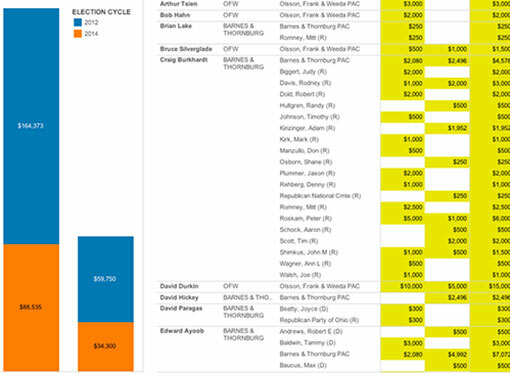 But lobbyists at Olsson Frank and Weeda and Barnes and Thornburg gave $224,123 in the 2012 election cycle and have already given $122,835 in the 2014 cycle. 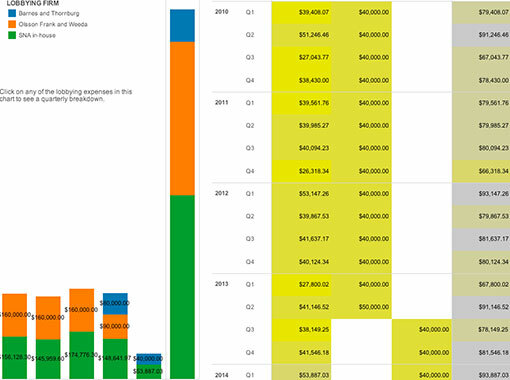 Many of these political contributions flowed to members of the agriculture and appropriations committees and lawmakers serving on other committees that oversee school lunch standards. As Politico noted last week, the School Nutrition Association shifted its lobbying expenditures from Olsson Frank and Weeda to Barnes and Thornburg in July of 2013 and has switched to a strategy of lobbying Congress, rather than the USDA, to weaken school food standards. These views accord with independent nutrition advocates like the Academic Pediatric Association, American Diabetes Association and the Public Health Institute, which issued a joint statement eariler this month asserting that “for decades, Congress has wisely ensured that federal child nutrition programs have been guided by science. Science-based decisions have served our children and our nation well. Accordingly, we strongly urge you to oppose efforts to intervene in science-based rules regarding the federal children nutrition programs.” Not surprisingly, when it comes to the food we feed our children, the views of these organizations support science over the interests of big food companies.